Craig Eastmond's late strike at Huish Park helped Colchester move above Yeovil in the League One table. Freddie Sears came close to putting Colchester in front midway through the first half, but his strike was blocked by defender Ben Nugent. Eastmond then broke the deadlock after the interval, slotting George Moncur's pass into the bottom left corner. Blackburn loanee Tom Eaves almost equalised for Yeovil but his header was well kept out by keeper Sam Walker. "We didn't do anywhere near enough against a team that was very defence-minded and left it to the two lads up front to break. "If you give it away as many times as we did in that attacking third, you find yourself sprinting back ninety yards because they're playing it forward. "We didn't take our opportunities, although we had three or four good chances. "Sam Walker showed us what we knew. He's a good keeper and he made a great save from Simon Gillett in a one-on-one. He saved a couple of headers and one at the end." Match ends, Yeovil Town 0, Colchester United 1. Second Half ends, Yeovil Town 0, Colchester United 1. Corner, Colchester United. Conceded by Sam Foley. Attempt saved. Tom Eaves (Yeovil Town) header from the centre of the box is saved in the centre of the goal. Sam Foley (Yeovil Town) wins a free kick in the attacking half. Substitution, Yeovil Town. Ryan Inniss replaces Seth Nana Ofori-Twumasi. Attempt missed. Joe Edwards (Yeovil Town) right footed shot from outside the box misses to the left. 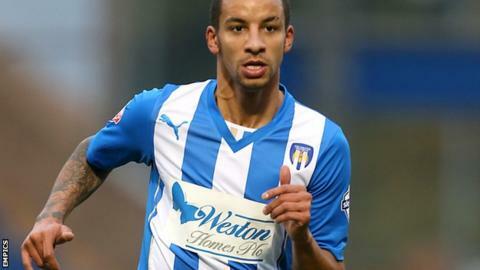 Delay in match Craig Eastmond (Colchester United) because of an injury. Corner, Yeovil Town. Conceded by Ben Gordon. Corner, Colchester United. Conceded by A-Jay Leitch-Smith. Goal! Yeovil Town 0, Colchester United 1. Craig Eastmond (Colchester United) left footed shot from the centre of the box to the bottom left corner. Attempt saved. Ben Nugent (Yeovil Town) header from the left side of the six yard box is saved in the centre of the goal. Substitution, Yeovil Town. A-Jay Leitch-Smith replaces Sam Hoskins. Substitution, Yeovil Town. James Hayter replaces Brendon Moloney. Attempt missed. Tom Eaves (Yeovil Town) right footed shot from outside the box misses to the left. Attempt missed. Sam Hoskins (Yeovil Town) right footed shot from the centre of the box misses to the right following a fast break. Attempt missed. Sam Hoskins (Yeovil Town) right footed shot from outside the box misses to the right. Corner, Yeovil Town. Conceded by Sam Walker. Attempt saved. Sam Foley (Yeovil Town) right footed shot from outside the box is saved in the top centre of the goal. Corner, Yeovil Town. Conceded by Sean Clohessy.